BRADENTON, FLORIDA – College track & field’s fun in the sun begins tomorrow as the NCAA Division II Outdoor Championships kick off at the IMG Academy an hour south of Tampa. The national team title races will be hotly contested and the individual event battles all three days – Thursday, Friday and Saturday – could be even hotter. We laid out the team race earlier this week, but we’ll break it down just a bit more – which events will have the biggest impact on both the men’s and women’s team races? We’ve got three picked out for each gender. Keep reading to find out which six to keep an eye on. If Lincoln (Mo.) wants to make good on its pre-meet favorite status, the Blue Tigers will need top-ranked hurdler Chrisdale McCarthy to likewise perform up to her billing. Getting 10 points is huge for any team, but, considering who else is in the hurdles field, it could be extra important. 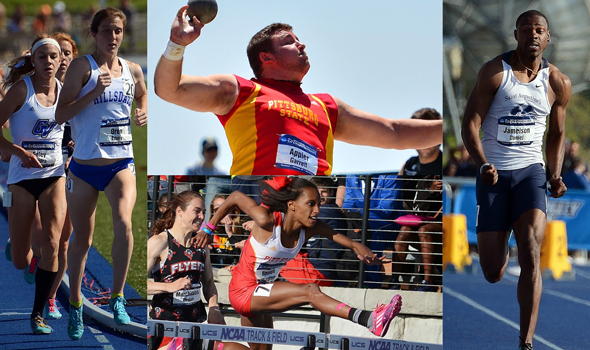 Nine other entrants come from teams battling for the national title – four of whom are ranked top-10 including 400 hurdles favorite No. 3 Tia-Adana Belle (Saint Augustine’s), No. 4 Courtney Nelson (Pittsburg State), and No. 8 Shamia Lassiter (Saint Augustine’s). Pittsburg State is a close second to Lincoln in the pre-meet rankings – and was ranked No. 1 as recently as last week – while Saint Augustine’s is third. Hurdlers from No. 4 West Texas A&M, No. 5 Hillsdale, No. 6 Grand Valley State, and No. 7 Findlay will also be battling for valuable team points. With the NCAA DII record and nine of the ten farthest throws in DII history, Garrett Appier of Pittsburg State is the definition of the phrase “overwhelming favorite”. But that doesn’t mean the field won’t be gunning for the top of the podium and the chance to overthrow Goliath – and it could have profound effects on the team race. That’s because 12 other men from national top-nine teams are battling for just eight scoring spots. That includes No. 2 Coy Blair (Tiffin), No. 3 Chris Saikalis (GVSU), Appier’s teammate No. 4 Bo Farrow, and No. 5 Jacob Mahin of Central Missouri. In total, seven of the top nine teams have a stake in the results of the shot put: No. 2 Texas A&M-Kingsville, No. 3 GVSU, No. 4 Adams State, No. 6 Central Missouri, No. 7 Tiffin, No. 8 Pittsburg State and No. 9 Ashland. The shot put could wind up being the seminal event of these championships, as the women’s competition may also hinge on what happens in the shot ring. Eight women from five different contending schools will take their turns heaving the steel shot, but perhaps no team has more invested in the event than Pittsburg State. The Gorillas have three women seeded ninth or higher, including indoor shot put champ No. 4 Cassie Caswell and No. 5 Jena Black. West Texas A&M also has two horses in the race with sisters No. 2 Norma Cunigan and No. 10 Holly Cunigan, while Central Missouri, Findlay and GVSU each have one. Back to the track now, where Division II’s fastest man – Lamar Hargrove of Tiffin – won’t be competing either at 100 or 200 meters this year (though he’s still entered as part of the 4×100 relay – more on that later). Though Hargrove isn’t in the field, there’s no shortage of sprinters from national team contenders. Saint Augustine’s could go a long way in securing a third straight team title with four entries in this event, including three of the top eight led by No. 4 Burkheart Ellis, Jr. Ellis is also the favorite at 200 meters. Adams State, traditionally a distance powerhouse, is hoping for No. 2 Jurgen Themen to break through for the title as one of its two entries in this event, while Tiffin hopes to make up for the loss of Hargrove with a win by No. 3 Reginald Thomas. Second-ranked Texas A&M-Kingsville also has two men in the field, including No. 5 Kenneth Jackson. Both Hillsdale and Grand Valley State bring well-balanced squads to Bradenton for this weekend’s championships, but make no mistake – distance running remains the bread-and-butter discipline for these two GLIAC rivals. Their endurance corps will go head-to-head this weekend several times, most notably at 5000 meters. Both schools have three entries in the race, and all, but one, are ranked top-10 nationally. Former cross country champ No. 5 Kendra Foley leads a GVSU trio that includes No. 10 Gina Patterson and reigning NCAA 10,000-meter champ No. 19 Amy Cymerman. Hillsdale’s top two are No. 4 Kristina Galat and No. 7 Hannah McIntyre, while defending national champ No. 8 Emily Oren could be tripling back for her third national title of the week (also 1500 and steeplechase). Big points are at stake here for whichever team can keep their pack closest to the front, and whoever doesn’t could suffer a big hit in the team standings. There’s no better way to electrify your athletes than a national title right off the bat to start the track action on Saturday. As many as five teams among our top-nine pool could have that chance when the final day of competition rolls around. Top-ranked Saint Augustine’s has the top-ranked 4×100, and a win could be a sign that their individual sprinters are in for big days. Second-ranked Texas A&M-Kingsville has the second-ranked relay, and No. 4 Adams State has, you guessed it, the No. 4 seed entering the championships. Tiffin (fifth) and Ashland (ninth) are also in the running. As mentioned before, Lamar Hargrove is entered as part of the 4×100 but not in either of his signature sprint events. Whether he ultimately competes could go a long way in the team race.